Just like our Phase II analog Rockwell Hardness Tester, the 900-345 Superficial Rockwell Hardness Tester comprises “state of the art” design and dynamic precision only found at Phase II. Used for testing thin and soft material in the Superficial Rockwell Hardness scales, this hardness tester is ruggedly engineered to obtain highly sensitive and accurate readings. Conforming to ASTM E-18 Superficial Rockwell Hardness standards, this hardness tester will offer unmatched repeatability in all Superficial Rockwell Hardness scales (table shown below). A perfect performer suited for any environment including heat treat facilities, tool rooms, workshops, laboratories and inspection labs. 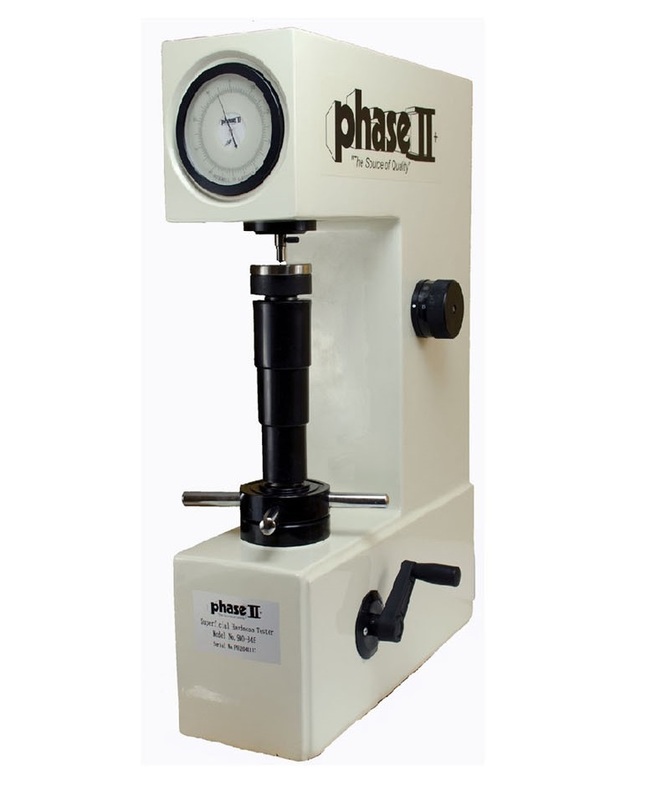 Lifetime technical support is included with all Phase II Hardness Testers. So test away with confidence and a level of accuracy you will only find at Phase II. This model is available with ASTM E18-08B or current certification.